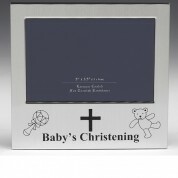 Lovely ranges of disposable Christening tableware with co-ordinated decorations for a baby boy or girl's special naming day. Give your ceremony that perfect atmosphere with the right decorations. Here at Babies Babies we offer themed ranges of tableware and decorations to add an element of style to your celebration, whilst remembering that the occasion is a very important event. You can also welcome your guests with drink in one of our disposable champagne or cocktail glasses and thank them for coming with our Christening Favours.